Someone can guide you on this better than myself but it appears that your battery is to low for the charger to work normally. Use " battery recovery" in the search box of this forum to learn more till more folks come online. Maybe the battery is too much low.... is there any other way to charge the battery..... i have a Nitecore single 8650 charger can i charge my lipo pack with it? It is also said that if the battery is too much low it could be dangerous. A hobby charger or USB recovery charge in EScribe, I am 99% sure the Nitecore will not charge low cells, Most XTar chargers will, but even then you would need to make up a lead and charge one cell at a time. 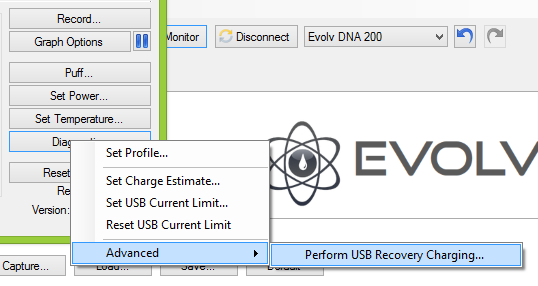 I got performed Escribe USB Recovery Charging....it worked and now the voltages of 3 lipo battery cells are above 3 volts, as well as, the voltages are in-line with each other. Because of your expert advice, i have succeeded to make my mod in working position, without sending the same to Evolv for warranty. One thing i want to confirm that whether (with this 25 Amp automotive fuse) my mod will work as worked with the on-board fuse. Is it safe? The fuse is mainly to protect the battery from a short in the mod and the auto fuse will be fine for that, it will be a little slower to blow than the SMD one so not 100% as good, all I can say is go by what John and James said in the other thread, they both work for Evolv John designed the board and I James does the software. Awsome sorted,,,, onviously im sure you know,, just tape up (insulate) your joints round the fuse base, or you will short out against somthing,, and undo everything youve done. ..
Tim Peke eat yer heart out..